Location: The Rotunda Gallery, Blenheim Walk Campus, Leeds Arts University LS2 9AQ. 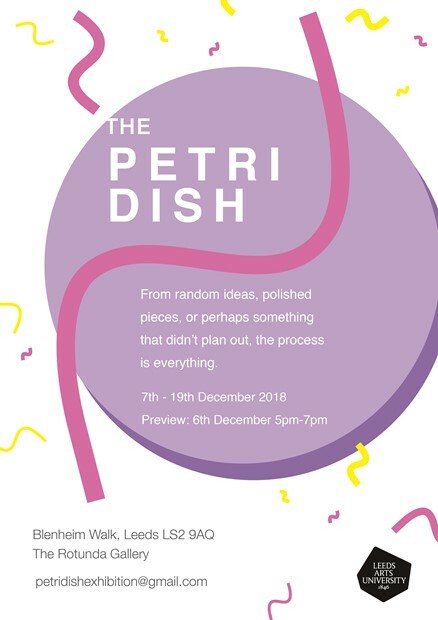 Petri Dish at the Rotunda Gallery, Leeds Arts University. 6th December 5pm - 7pm. The artist’s process is continuous, experimenting to find one's own unique style; yet often we only focus on the finished work. Petri Dish showcases the artistic journey towards the finished piece. From random ideas, polished pieces, or perhaps something that didn’t plan out, the process is everything. The Rotunda Gallery is wheelchair accessible by lift. The exhibition continues until 19th December 2018, by appointment only. Please call 0113 202 8000 to arrange.